I’m no stranger to rice. Any given chance to gorge myself on rice, I will gladly take it. I have yet to meet a variety I won’t try. Steamed rice, rice pudding, fried rice, rice balls — it’s all very familiar to me and if I ever find myself in need of a last meal, rice would be requested. Since summer is not over yet, I’ve been trying to take advantage of our grill. Despite our grill needing a bit of love after our move, I couldn’t pass up Labor Day without throwing something on. And my choice was chicken. When I think about BBQ chicken, my first thoughts bring me to the soy sauced marinated variety I grew up with. I didn’t discover the sweet, tomato-based variety until later in life. With soy sauce, some vinegar, citrus juice and an overnight marinade in the refrigerator, it’s ready for the grill. When marinating, I usually eye the ingredients without fast, hard rules about measurements. (Check out Canine Cologne’s version of BBQ chicken.) The best part of the chicken to BBQ are the chicken thighs. It’s flavorful, a bit fatty and it doesn’t dry out quite easily like the breasts. With such flavorful chicken, steamed rice works just fine but I wanted to make red rice using annatto seeds aka achiote. Red rice is an option alongside the steamed variety at many Guamanian/Chamarro restaurants. 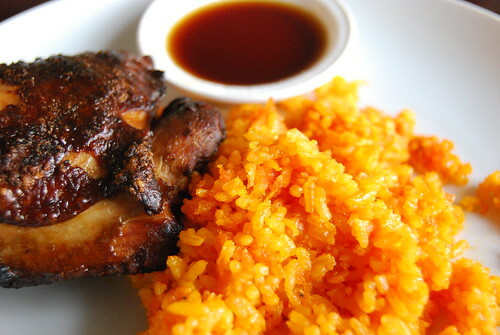 Meat and rice is the center of many Guamanian meals. Using annatto seeds to color the rice doesn’t really add substantial flavor although some people have described it as tasting peppery. Some people eat the annatto seeds, but I prefer to soak them in the water used to cook the rice. When finished cooking, the rice is tinted a vibrant red. 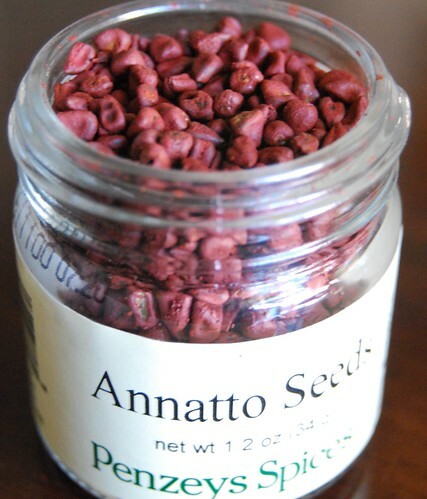 Annatto seeds can be found at many grocery stores, including Hispanic markets and my new favorite specialty store, Penzeys. I’ve used annatto seeds to give a nice golden tone to risotto (using a bit of olive oil with the seeds simmered in it for a few minutes) or noodle dishes. 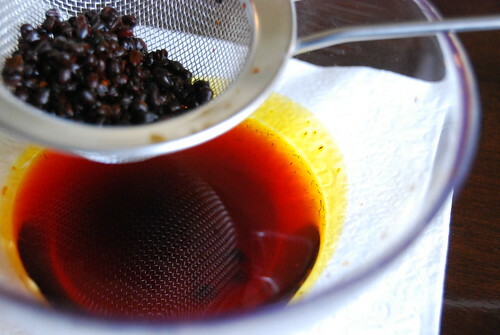 They can be fried in a little oil to release the color if oil is required in a recipe. Mix all the ingredients in a large bowl and marinate overnight or for several hours. Drain and discard the fluids. Heat grill to low heat according to instructions. Place chicken skin side down, flip after 10-15 minutes and cook until chicken is cooked all the way through. Soak annatto seeds in the water for 2-3 hours. Strain and reserve the water. Cook rice according to directions. Optional dipping sauce: Equal portions of soy sauce with lemon juice and pepper adjusted to taste Or just use bottled Ponzu. The picture of your ‘Red Rice and Chicken’ brought me to read your post and brought water to my mouth. I’m very keen in trying to cook it at home. I love to cook chicken and rice forms part of my everyday life. You made the red rice using annatto seeds; I would like to know what it is actually. I live in Mauritius and I never heard of it. In case I don’t get the annatto seeds, I would like to try the chicken with tandoori rice. I think it should be OK. What do you say? Any other serving suggestion that you would like to propose me? The chicken seems yummy. For the BBQ chicken, here, we simply bring the chicken on the grill and apply a sauce made of very small quantity of water, honey and some thyme. You can also add some oyster sauce and garlic paste and pepper to the chicken beforehand. Using lemon depends. At time, we use chili powder and add it to the chicken. What if I replace the apple cider vinegar by vegetal vinegar? Or, simply I don’t use vinegar at all and maximize the use of the lemon juice? I was hesistent to post the recipes since I tend to “fly by the seat of my pants” when grilling chicken but those are the measurements I tend to stick to and adding more or less of something depending what I have on hand. So omitting vinegar and just using lemon would be fine. As for your question about annatto, they are seeds from the achiote trees and considered a spice. And tandori rice with chicken sounds wonderful. I will try your version of chicken with water, honey and thyme as well. Your chicken looks MASARAP! You had the skin on yours too! I like how you used apple cider vinegar in your marinade. I was bummed that I ran out of the spicy banana ketchup. It really gives a nice red color to the meat. I haven’t made red rice in awhile. This older Guamanian lady I used to see at the gym told me her secret was adding chopped celery leaves and bacon to her red rice! Re: the annatto seeds, the Guamanians call it “achiote” (same with Spanish speakers), the Filipinos say “atsuete”. My mom likes to fry the seeds in oil to make it super red, then adds it to her adobo. She discards the seeds though. Thanks for the recommendation. I will have to try to add celery leaves and bacon to it the next time I make it. Hello, this lokks very nice! I will cook it next time! Thanks for this nice recipes! Look for them in the Hispanic aisle of your grocery store. I cheated and just used Sazon (Goya) seasoning. 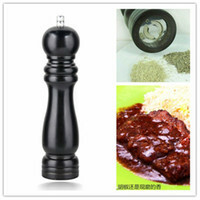 It already has the annato in it plus some seasoning. I think I’ve seen that. I’ll check it out. Thanks. re: Penzeys. Me too! It my new fave store.